In a marriage of Chinese tech and Dubai financing, the world’s first taxi drones look set to take to the skies this summer. Controlling the single seat, eight-rotor fully-automated Ehang 184 drone couldn’t be more simple. The passenger uses a touch screen to select a destination and the battery-powered drone takes care of the rest. The taxi drone boasts a maximum flight time of 30 minutes, a top speed of 100 mph and re-charges in two hours. According to its designers, the safety of their taxi drones need not be a worry: Redundant processors and sensors can kick in should the primary systems encounter a problem, and the AAV is designed to automatically locate the nearest safe landing spot and touch down should that happen. 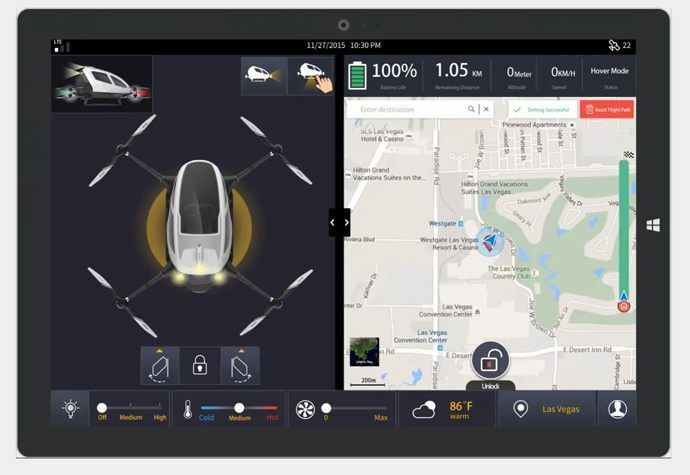 EHang’s system uses a centralized control room from which it can monitor and take control of the 184 via an encrypted LTE connection. As for performance, though the top speed is around 100 mph, Dubai is likely to restrict the EHang 184 to around 62 mph. Electric, it’s able to fly for around 30 minutes on a full charge, and recharge in 1-2 hours. Maximum cruising altitude is 3,000 feet, and the craft has a footprint roughly 13 feet square; it uses cameras among other sensors to identify a landing spot and position itself accordingly. Approval of the taxi drone by Dubai’s Roads And Transport Authority could mean flights within the year. Drones are already a disruptive technology that have transformed aerial photography and surveillance. While it remains to be seen whether these taxi drones launch in Dubai as soon as is promised, the power and autonomy of drones is developing at such a pace that their eventual introduction seems inevitable. Not all breakdown companies are the same. Established over 26 years ago, and with over 5,000 recovery trucks on call 24/7, we have a proven track record of providing efficient, reliable breakdown cover. We’re not yet equipped to recover taxi drones, but we have been voted Britain’s most ethical insurance company by the Good Shopping Guide. We handpick only the best local mechanics and garages around Britain to send out if you break down. We believe this way of working is efficient, environmentally friendly and helps supports local communities and economies, too. On top of this, we offset the carbon emissions of the recovery trucks that go out to assist you, reducing the impact your breakdown has on our environment. Every breakdown policy you buy helps fund the work of our charity, the ETA Trust, which campaigns for a safer, cleaner transport future. Reassuring words there about safety, but I want to know more before I get enthusiastic about more things flying around. I’m reminded of the police helicopter which came down in Glasgow striking a pub and killing 10 people. And what of the resource use?